SW Futurity - RV's!! - Don't shoot the messenger! - The Glendale Police Department does not allow overnight parking on their property (which includes the old Gamma Construction property) - So - for Thursday night you cannot stay in that parking lot - you will need to either go to the Staybridge parking lot, Perhaps Target if they do not have a problem with it - you can use that parking lot during the day - and after 5:30 pm on friday - you can move to the private parking lot across from the park. Sorry All - but we were just notified today. Thanks to our Sponsor - Royal Canin! Combined Fall 2017 Specialty Shows! Rocky Mountain GSDC & Pikes Peak GSDC! The pre- registration price is $30 for first dog entered. $25 per dog thereafter. On day of test entry registration is $35.00 first dog and $28.00 for any no. Of dogs thereafter. Start time is 9 a.m. For run through with evaluator Gene Gray you need to be there by 9 a.m. He will take you through without dog at your scheduled time if you absolutely can not be there at 9. You may enter day of test. This is a Pass/Fail Test. No dog to enter, no problem. 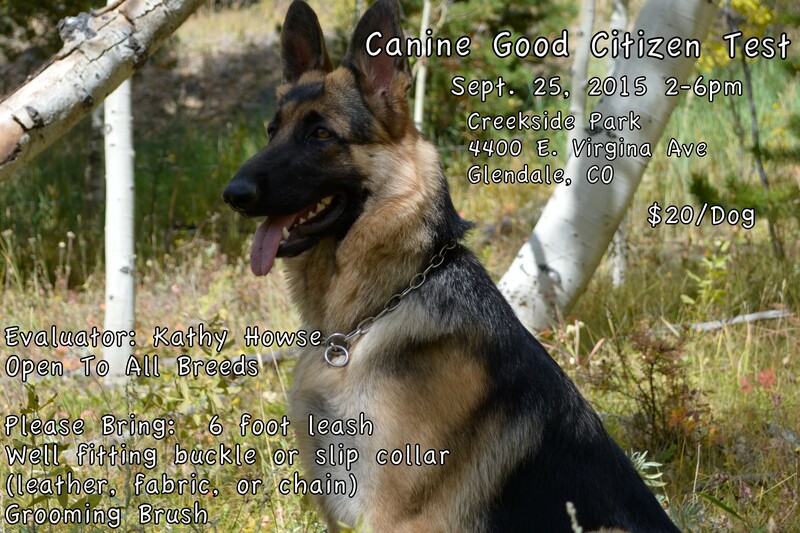 Come out and watch others run their dogs and learn more about our breed. Combined Spring 2017 Specialty Shows! Combined Fall 2016 Specialty Shows! Combined Fall Specialty Shows! Four Shows/Same Location!